Springtime comes to Aria, the ‘Secret Garden’ restaurant within the Hyatt Regency Birmingham, with a brand new menu for the new season. I visited the Aria restaurant as a guest of the Hyatt Regency Birmingham. The Aria restaurant in the Hyatt Regency Birmingham has recently launched their new menu for Spring 2019. It continues the theme of The Secret Garden, the classic novel by Frances Hodgson Burnett. Aria’s talented chefs have created a menu which is packed full of seasonal flavours, colours and fragrance. The addition of South Asian spices is an nod towards the early life in India of the novel’s main characters. And the use of micro herbs is an extra added dimension to this imaginative menu. Aria sits within a beautiful atrium setting within the Hyatt Regency Birmingham. The hotel is located in the centre of Birmingham, and the 24 floor glass fronted building overlooks Centenary Square and many of Birmingham’s iconic landmarks. The hotel is easily reached by road, and is just a few minutes drive from Junction 6 of the M6. If you are travelling by train, the hotel is about 10-15 minute walk from Birmingham New Street Station. I was invited to try the Spring menu on a press night at Aria, but had to shoot off early to catch a train home. So they kindly offered to host me again a short while later. Aria is a beautiful place to visit at any time of day. In the daytime, natural light floods the airy space while the water features and large trees dotted around give a very peaceful and natural feeling. 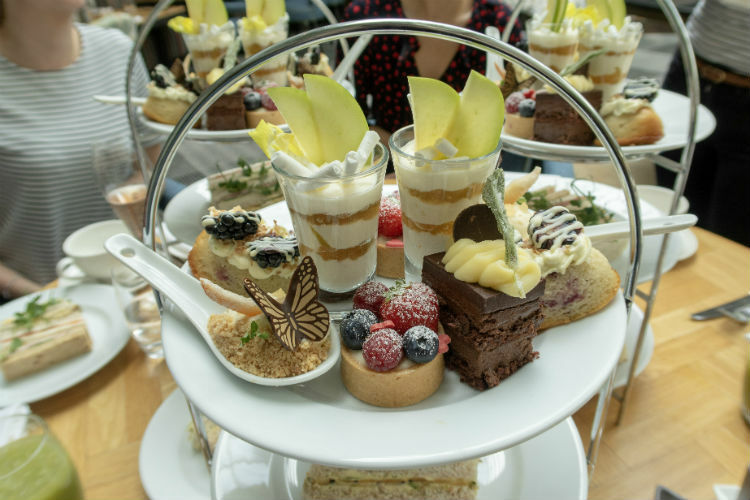 It’s the ideal place to meet up with friends over an elegant and delicious afternoon tea. When I tried this treat, I fell in love with their delicious selection of elegant sandwiches and the delicate freshly-made fancies. The ambient lighting inside Aria gives it a relaxing and intimate atmosphere, while twinkling fairy lights dotted around the trees lend a touch of magic. The warm and magical atmosphere of Aria make it the perfect location for a romantic meal or to celebrate a special occasion. Your evening will get off to a wonderful start in the Aria bar inside the hotel lobby. It’s a perfect place to enjoy a relaxing drink at the end of the day, or to start off your night out in Birmingham. The bar stocks the excellent range of Hattingley Valley English sparkling wines, with the rosé being particularly delicious. Or if you fancy starting your evening off with a cocktail, why not try the bar’s signature cocktail, ‘The Secret Garden’. This mixes mint and elderflower with in-house-infused cucumber vodka – it’s a wonderful combination! Moving through to the restaurant for dinner, I discovered that my place setting featured a pretty hand-tied sprig of dried flowers. I thought that was a lovely little touch. For a pretty spring-time starter, why not try a perfectly cooked duck egg, surrounded by charred asparagus tips, mushrooms and a selection of beans and peas packed full of spring flavour. It is a very fresh dish, which looks like Spring on a plate and tastes absolutely delicious. Other options for your starter include the classic combination of scallops, pea puree and black pudding. This dish is also accompanied by micro leaves and a lemon scented oil adds lightness to the dish. A chunky pork terrine full of tender pieces of meat is accompanied with a fresh home-made piccalilli. This adds both colour to the plate and a freshness of flavour that is very spring-like. And the seasonal soup features a small pile of spiced chickpeas which are topped at the table with a creamy cauliflower and broccoli soup, poured from an elegant teapot. Prices for the starters range from £8.50 to £14. I find that I’m eating less and less meat these days. So I selected the spinach and courgette orzotto, which was topped with a lightly battered, ricotta-stuffed courgette flower. Orzotto is similar to risotto, butThe orzotto was amazing, very creamy and comforting but with a light flavour. The battered courgette flower isn’t the easiest dish to photograph, but the molten ricotta within oozes into the orzotto to take the creaminess to another level. There’s also a beautiful dish of artichoke hearts stuffed with perfect miniature dice of vegetables and a goat’s cheese glaze. Some restaurants still offer vegetarians a disappointing choice, but I was really impressed with both of the vegetarian options on the menu at Aria. For the meat-eaters this spring, the grass-fed Irish Angus fillet steak is served with saute new potatoes, spring vegetables and a peppercorn sauce. While the Goosnargh chicken breast comes with dauphinoise potatoes, roast carrots and a garlic jus, and the Spring Lamb is accompanied by scallion mash, romanesco broccoli and a red wine jus. Mouthwatering stuff! Prices for main courses range from £15.50 to £36. So after all of this delicious food, don’t forget to save room for a little dessert! If you have a sweet tooth, there’s plenty to tempt you on the Spring menu at Aria! The pretty white chocolate and pistachio tart is topped with shards of pistachio brittle,. The light flavours, creamy chocolate ganache and decoration of edible flowers makes this dessert perfect for Spring. Or will you choose the chocolate sphere, filled with decadent chocolate brownie, chocolate mousse and orange gel? The chocolate mousse is somehow both light and creamy, with a rich chocolatey flavour. I had a taste and actually wished that I’d chosen it for myself! Or will the refreshing flavours of the blood orange and ricotta cheesecake suit your palette better? I love finishing my meal with a cheese board, and Aria put together a fabulous selection of British cheeses with home-made chutney, sourdough crackers and other accompaniments. Prices on the dessert menu range from £9.50 to £14.50. Aria at Hyatt Regency Birmingham is a wonderful place to spend an evening. The atmosphere is tranquil, the decor beautiful and the service is top class as well. This is definitely the perfect restaurant for a special occasion, a romantic date night, or just an evening in Birmingham catching up with good friends. Will I be making a return to the Secret Garden? Most definitely! Thank you to the Hyatt Regency Birmingham for a wonderful evening at the Aria restaurant!